Building on its success in machining blades complete from solid in a single set-up (rather than machining batches of forgings), JJ Churchill continues to ‘set the bar’ in gas-turbine blade machining. Working closely with Birmingham-based machine supplier Starrag UK Ltd (www.starrag.com), the company is developing production processes that are structured to consistently produce world-beating time and manufacturing benefits through the implementation of both in-process probing (before machining commences) and adaptive milling routines. Both techniques are forecast to result in significant savings in overall production times, as well as improved surface finishes that will eclipse the 0.7/0.8Ra currently being achieved by JJ Churchill when using a ‘super-finish mode’ on the Starrag machines. These developments, which are being evolved in close co-operation with the Swiss machine tool builder (it has so far supplied five high-speed five-axis machining centres to JJ Churchill, with another on order), are among a number of initiatives being led by the blade machinist’s head of engineering Will McAleese, along with his team. Mr McAleese said: “It is some time now since we proved that machining blades from bar has a number of advantages over the traditional route of machining forgings, not least because the process negates the need for relatively large batch sizes; one-offs to 90-off are feasible, compared to a minimum batch of about 300-off when forgings are used. “Moreover, the resultant time savings can be enormous, particularly as lead times for forgings can sometimes be a year. The ‘springboard’ into such a highly flexible method of blade production was mapped out by Market Bosworth-based JJ Churchill in 2008, when it started its association with Starrag UK for machine supply and with Starrag Switzerland on the joint development of the process and programming/cutting parameters for the machining of double-ended stators. The resulting ‘fast-make’ strategy has since been applied to a number of contracts with customers that include Rolls-Royce, Siemens and Safran. 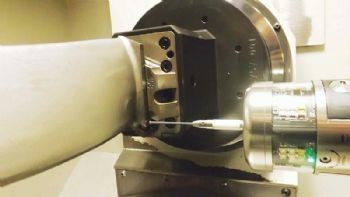 However, this approach to blade machining continues to be refined, as Mr McAleese explains: “A blade is held by clamping between the machine’s tailstock and driven head; rather than machining commencing on the assumption that the blade is positioned and held accurately every time, which is not always the case, we now probe the root — using a probe stored in the machine’s tool magazine — to accurately determine its position. “Using Starrag’s RCS CAM software, the machining program is then automatically adjusted to accommodate the blade’s true position within the machine and the ‘best fit’ position of the blade in relation to the root is determined. “This means that we can eliminate the need to measure the blade with a CMM after machining and, if necessary, adjust and re-write programs prior to undergoing a period of post-programming before we can re-start machining. Starrag, which is the preferred supplier to JJ Churchill for aerofoil machining, developed RCS specifically for five-axis high-speed blade machining. 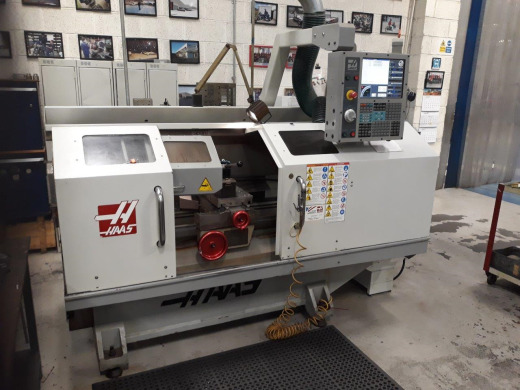 It offers an extended selection of machining strategies, and it provides highly efficient and effective programming due to its parametric input structure. Moreover, cycle times are minimised, thanks to the software’s optimal selection of milling strategies, which takes the best and most effective cutter path in relation to blade cusp height and tool radius. In addition, the latest version (7.4) of the RCS software includes improved routines for ‘snubber machining’, trochoidal milling and reduced tool wear, while significantly reducing pre-production programming times. Used by JJ Churchill in conjunction with its Unigraphics CAD system, RCS enables programmers to create difficult features, such as variable-fillet radii. The company has also developed an in-process ‘polishing’ routine for the Starrag machines. Blades are first rough-milled to within 2-3mm of final form before finish machining then applying Starrag’s ‘super-finish mode’. RCS’s capability for adaptive milling is also being applied by JJ Churchill to create perfect blends on aerofoils, on both bar and forged blades. Here, Haimer heat-shrink tooling and 2mm-diameter ball-nose cutters play a key roles. Mr McAleese said: “Better surface finish is the result of decreasing the cutter step-over, which also creates far less stress in the material, improves process capability and extends tool life. JJ Churchill has a long history of machining compressor blades, having been a supplier to Rolls-Royce since 1947. Indeed, company founder Walter Churchill worked with Air Commodore Sir Frank Whittle, who is accredited with the invention of the turbojet engine. Today, the company not only specialises in the prototype development and spares supply for a variety of aircraft programmes but also plays a key role in OEM production programmes for both compressor and turbine blade work, which currently account for 35 and 65% of its business respectively. Moreover, it recently signed £70 million contract with Rolls-Royce for the supply of turbine blades on a rolling 10-year programme. JJ Churchill’s on-going process developments also include the 3-D printing of fixturing and work into the machining — from solid — of titanium aluminide blades.